Culver’s offers different take on a breakfast sandwich, layering hash browns on grilled bread along with cheese, mushrooms and green bell peppers. 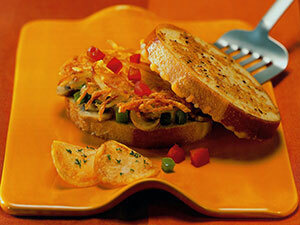 A zesty Parmesan-garlic spread further differentiates the sandwich, which can easily morph into a lunch item. 1. For Parmesan-garlic spread: In small bowl, combine butter, garlic and parmesan cheese; set aside. 2. On oiled griddle, place potatoes; cook 4 to 5 minutes until golden brown. Turn potatoes over, season with salt and pepper and cook 1 minute longer. 4. On same oiled griddle, place green pepper, mushrooms and tomato; saute for a few minutes. 5. To assemble, placed browned potatoes on slice of bread without cheese; add cooked vegetables and top with second slice of bread, melted cheese-side face down. Remove from griddle, cut in half and serve.